... we were in Kumasi -Akufo-Addo Accra, Feb. 10, GNA - Nana Addo Dankwa Akufo-Addo, Foreign Affairs Minister, has expressed surprise about what he described as ill-informed and irresponsible statements being made about Ghana's supposedly silence about the coup in Togo and the installation of Faure Gnassingbe as successor to his father, President Gnassingbe Eyadema. Nana Akufo-Addo noted that those lambasting the Government for its so-called silence had been those who had supported dictatorial and unconstitutional regimes and yet were the loudest to condemn President John Agyekum Kufuor for his silence. The Foreign Affairs Minister was speaking to Journalists at the Kotoka International Airport, on his arrival from Niger, where he accompanied President Kufuor to attend the Economic Community of West African States (ECOWAS) Extraordinary Summit on Togo. Nana Akufo-Addo said President Kufuor, and for that matter the Government of Ghana's hesitation in stating a position was to ensure that any decision taken would be in line with the collective stand of ECOWAS. "When the news of the death of Eyadema, and the subsequent installation of his son as President broke out, we were in Kumasi and, therefore, could not rush to take a decision, especially when President Kufuor had just handed over the ECOWAS Chairmanship to Niger." Nana Akufo-Addo said Ghana's geopolitical position with respect to Togo necessitated the exercise of the greatest circumspection and not rushing to make a decision. 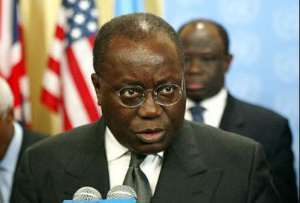 On the issue of Ghana Ambassador to Togo's presence at the inaugural ceremony of Faure Eyadema as President, Nana Akufo-Addo said being the Dean of the Diplomatic Corps it would have been very difficult for him to refuse to attend the call of the Togolese Foreign Minister when he summoned him.